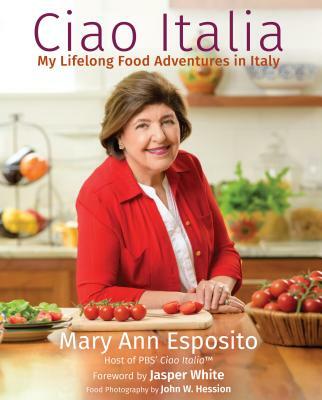 Start your busy Thanksgiving Day off right with my mom's cinnamon rolls recipe, which is reproduced here from my new book, Ciao Italia Family Classics. To make the dough in a stand mixer combine together 4 1/2 cups of the flour, the sugar, salt and yeast. Combine the water, milk, eggs, and butter Add to the dry ingredients and process a ball of dough forms around the blade. If dough is sticky, add more flour a tablespoon at a time until a soft, but not sticky ball of dough forms. Transfer the dough to a lightly floured surface and knead with your hands until it is smooth and not sticky. Add more flour if necessary. Transfer the dough to a lightly butter bowl and cover tightly with plastic wrap. Allow the dough to rise in a warm but not hot place (72 F is ideal) until doubled in size. Meanwhile mix the cinnamon and sugar together in a small bowl and set aside. When the dough has risen, punch it down and roll it into a large 18-inch long by 12-inch wide rectangle. Brush the dough with the melted butter and evenly sprinkle the sugar mixture over the top. Sprinkle the raisins over the sugar. Start at the longest side nearest you and roll the dough up on it self tightly, forming a long log Pinch the ends closed and the two sides. With a knife cut 18 one-inch slices and place them on lightly greased baking sheets about 1-inch apart. Cover the rolls and allow them to rise again until doubled in size. Meanwhile make the glaze by combining the confectioner’s sugar and lemon juice in a small bowl and whisking it until a thin glaze consistency is obtained. Cover and set aside. Bake the rolls until lightly browned, about 25-30 minutes. Transfer the rolls to a cooling rack. 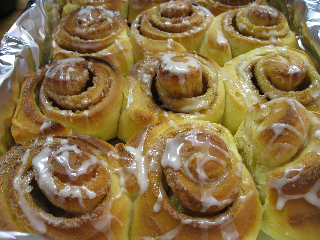 Use a fork dipped in the glaze and drip it over the tops of the rolls. These are best eaten warm.